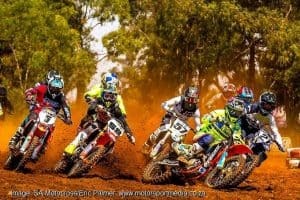 Speculation may be rife on who will take that holeshot when the first gate drops to see the 2019 TRP Distributors South African National Motocross Championship burst into action at Port Elizabeth’s Rover Raceway Saturday 23 February, but there is also so much more motocross excitement to look forward to. Race distances, for example, will be longer than before, bringing them in line with international standards, which means longer, harder races and where better to implement that change than at the torturous, tough and sandy Port Elizabeth Rover motocross track? So rest assured, South African motocross will be bigger than ever in 2019. Tennant’s 2018 Q4 Fuels Husqvarna teammate Maddy Malan is looking to take up where Caleb left off last year as he embarks on a double MX1 and MX2 attack following a successful Summer Series in Harare over December and he will be hoping a bit of consistency will pay dividends following an off-season of musical chairs around him. Tristan Purdon has swapped blue for Red Bull KTM orange alongside Josh Mlimi and Kerim Fitzgerald, while his Yamaha place is taken by Anthony Raynard this year. Top privateers include Cameron Odendaal and Lloyd Vercuil who returns in MX1, while MX2 holeshot master John Vogelesang will have a few high school class graduates to keep an eye on, with Justin Sangster, CIT Husqvarna rider Slade Smith and Ricky Raaff in the hunt and Tennant likely to make the occasional appearance to stir it all up too. Moving on to the junior classes, SA’s German ADAC MX Masters Junior Cup Champion Camden McLellan will be out in PE aboard his Red Bull KTM, before heading back to race abroad, which should leave Dalton Venter, Cam Durow, Jonathan Mlimi and the like with enough to think about in that thick Rover sand. The action will be fraught in Port Elizabeth, with top younger riders graduating to take on champions in every class of the TRP Distributors South African National Motocross Championship over seven rounds across South Africa through 2019. Who the favourites will be remains to be seen, but rest assured that the action will be as wild as ever when that first gate drops at Rover come 23 February. Practice starts 07h30 with racing from around 10h00 Saturday morning — find Rover Raceway on Victoria Drive, Schoenmakerskop in Port Elizabeth — gate entry is R60 per adult and free for kids under 12, where cracking racing, full catering, souvenirs at the Sunoco Race Shop and the rest will ensure a great day’s racing for all. Contact info@mxsa.co.za or go to www.samxnationals.co.za for more.